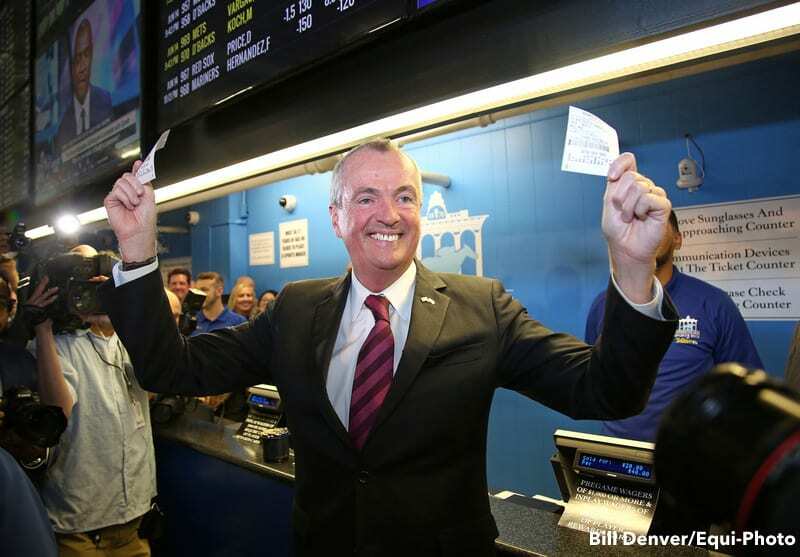 The sports book at Monmouth Park racetrack opened for business Thursday, and New Jersey governor Phil Murphy kicked things off by placing the first sports bets since a Supreme Court ruling last month opened the door to states legalizing the practice. Murphy bet $20 on Germany to win the soccer World Cup, which kicked off in Russia Thursday, and a $20 wager on the New Jersey Devils to hoist the Stanley Cup in 2019. The Supreme Court decision that struck down a 1992 federal law prohibiting states from enacting sports gambling was based on a New Jersey law being battled in court. ABC News/ESPN reported that hundreds of people came to place bets Thursday at Monmouth Park, which has 21 windows for sports wagering. The sports book is a joint venture between Monmouth Park and William Hill. “As of this morning the breeding and racing industry in New Jersey began a new life. Sports betting in New Jersey and throughout the country began a new era. In New Jersey, the breeding industry was suffering from a diminished crop of state bred foals and farms were disappearing from lack of business, but now opportunities in both areas are open to new beginnings. We can thank Dennis Drazin & the State of New Jersey for their tireless efforts in achieving this monumental goal. For seven years Dennis dreamt it, believed it, and brought it to fruition. On behalf of the Thoroughbred Breeders' Association of New Jersey, thank you for helping us achieve our dream of a flourishing foal crop in New Jersey and success in all aspects of the racing industry. This entry was posted in NL List, The Biz and tagged monmouth park, New Jersey, new jersey sports betting, phil murphy, sports betting, sports gambling, sports wagering, william hill by Paulick Report Staff. Bookmark the permalink.